Matthew Kelly (left) was down to a single chip against Terrence Chan in round two of Event #53 ($1,500 Limit Hold'em Shootout). Kelly would win one hand to double up to two chips, but that was all the luck he could muster as his 8-5 couldn't catch up to Chan's Q-3 suited. Chan would advance to the final table, and Kelly had nothing but nice things to say about him, calling Chan one of the best limit players in the world (a view shared by many) and an extremely nice guy. Claudio Rinaldi (right) congratulates Jonathan Little for winning their table in round two of Event #53 ($1,500 Limit Hold'em Shootout). Little has two WPT titles, a World Poker Tour Player of the Year award, and more than $4 million in live earnings, but this victory sends him to the first WSOP final table of his career. 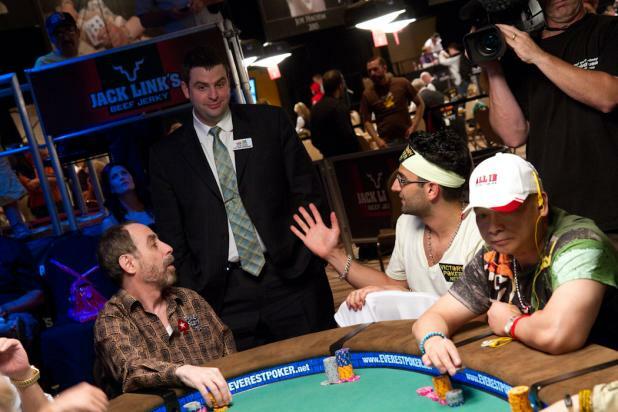 Barry Greenstein (seated, left), and Antonio Esfandiari (center) speak with WSOP Tournament Director Jack Effel (standing) in the final minutes of Day 2 of the WSOP Tournament of Champions. With 17 players remaining, the players and staff are trying to find time on the schedule to play some more levels, hoping to reach the nine-player final table before Sunday. There were a lot of conflicts, as action ended early the day before so Erik Seidel could play the final table of Event #46 ($5,000 Pot-Limit Omaha Hi-Lo), and today, Esfandiari is still alive on Day 2 of Event #47 ($1,000 No-Limit Hold'em). The morning of July 3rd is open for most of the players, but Annie Duke will be busy working the Ante Up For Africa charity tournament. It was finally agreed to resume play on Saturday, July 3 at 7:00 pm, provided nobody was still alive in another event. 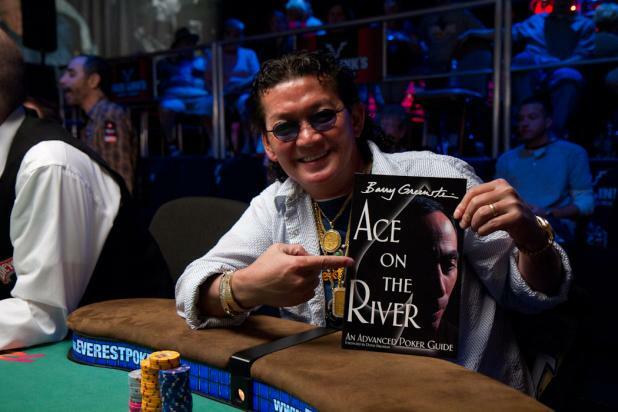 Scotty Nguyen poses with Barry Greenstein's book, "Ace on the River." 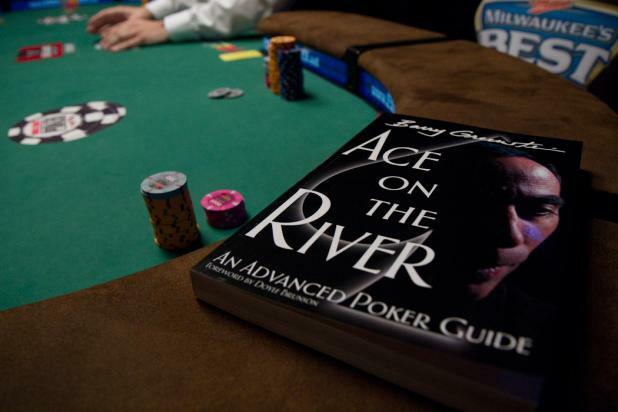 Greenstein gives the book as a bounty to whichever player busts him from a tournament, but he hasn't busted yet -- Nguyen is jumping the gun a bit during a break on Day 2 of the WSOP Tournament of Champions. 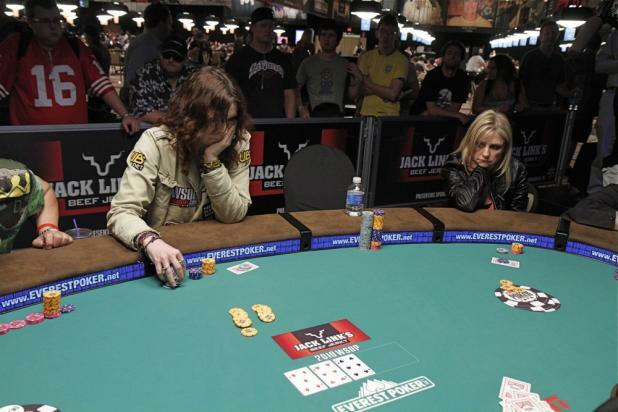 Annie Duke (left) faces off in a hand against Jennifer Harman on Day 2 of the WSOP Tournament of Champions. Both Duke and Harman have been called the best female poker player in the world, and both have resumes that justify the claim. Duke won $2 million in the original WSOP Tournament of Champions in 2004, and also won an open WSOP bracelet that year. Harman is the only woman who regularly plays in the biggest live cash games, and she is the only woman who has won two open WSOP bracelets. In this one hand, Duke would come out on top (Harman folded to this raise on the flop), but both players would survive the day. In a rush to get back to the WSOP Tournament of Champions, Antonio Esfandiari (standing, right) checks his cards before moving all in on Day 2 of Event #47 ($1,000 No-Limit Hold'em). One player called with A-Q, and Esfandiari turned over J-9. 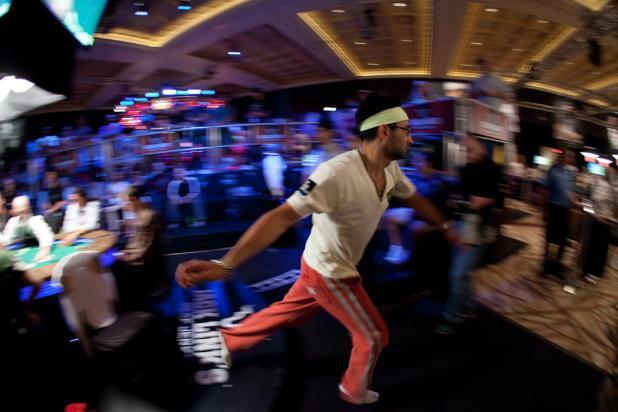 Rather than wait to see the result, Esfandiari ran back to the TOC to play a hand in that event. 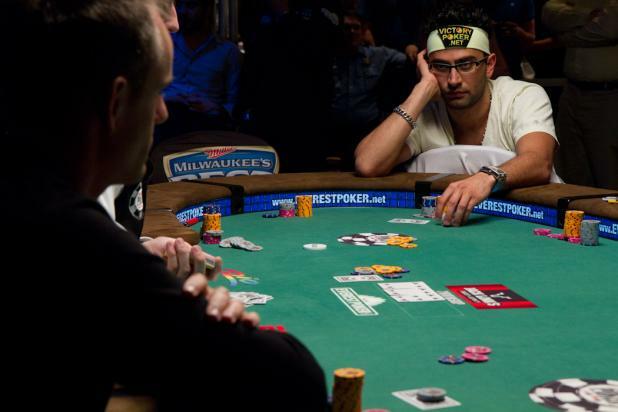 When he returned to Event #47, Esfandiari learned that he had doubled up. Esfandiari would continue two-tabling until the TOC's action came to an end after four one-hour levels. In addition to the WSOP Tournament of Champions, Antonio Esfandiari is also playing Day 2 of Event #47 ($1,000 No-Limit Hold'em). Fortunately for him, his seats in the two events are right across from each other, separated by a small walkway for spectators. Esfandiari's father was on hand to watch his other tournament for him, and let him know when cards were being dealt so he could run over (usually in about five seconds). 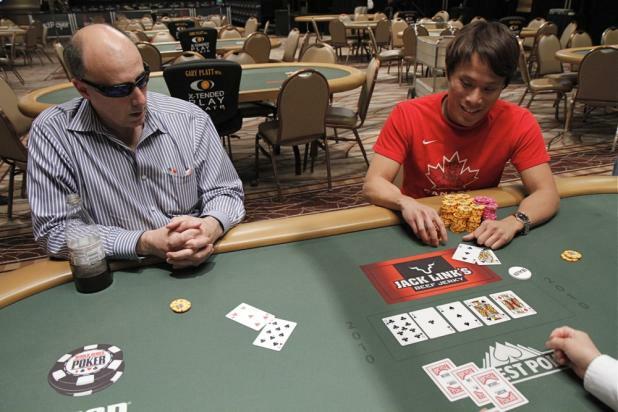 Here, he is leaving his seat at the WSOP Tournament of Champions to play a hand in Event #47. 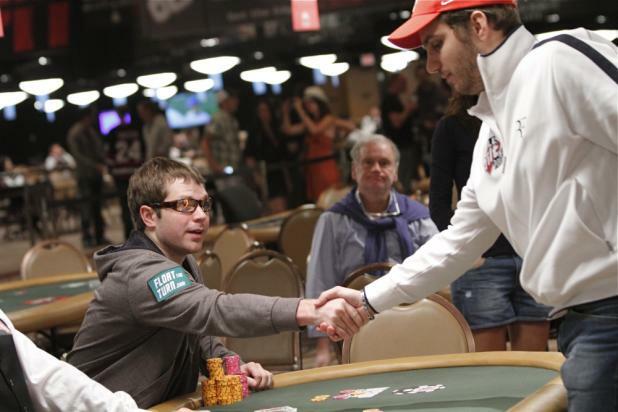 Antonio Esfandiari (right) stares down Allen Cunningham during a hand on Day 2 of the WSOP Tournament of Champions. While Cunningham received the sixth-most votes (10,486), Esfandiari barely made the TOC cut with the 20th-most (5,129). 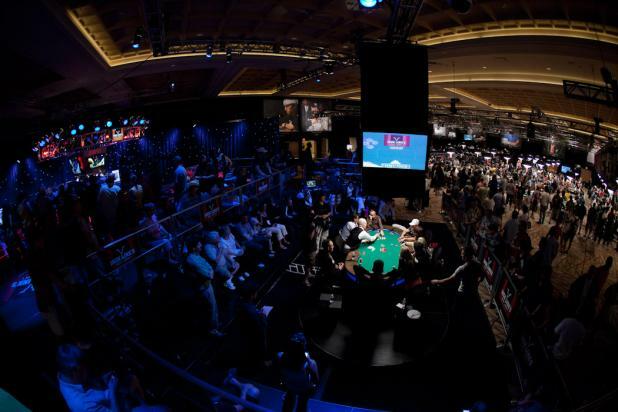 But regardless of the vote totals, every player begins the WSOP Tournament of Champions with an equal stack. 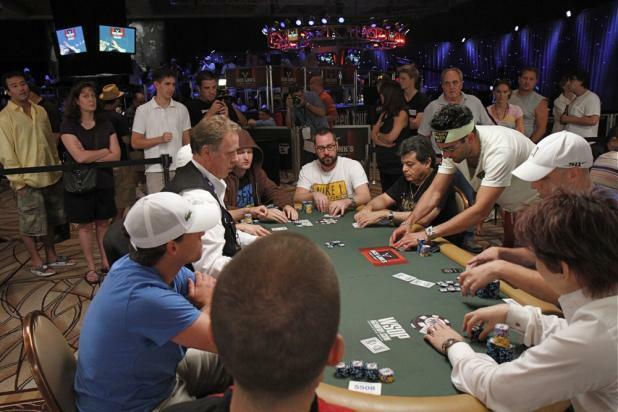 With 18 players remaining in the WSOP Tournament of Champions, everyone is seated at the primary two featured tables. Only the final nine will reach the money and claim part of the $1 million prizepool.